The 2018 British Grand Pain at Silverstone proved to be a challenging affair for home hero Lewis Hamilton. Despite the fact that he started on pole, Hamilton wasn't able to take victory. This was partly because a hand-charging Sebastian Vettel proved, ultimately, to be unstoppable, especially with the Ferrari seemingly making more power now than ever before (if you don't believe us just ask Nico Rosberg who has a source inside Ferrari who gave him this information). Then there's also the fact that there was a first lap crash between Hamilton and Vettel's Ferrari team-mate Kimi Raikkonen that complicated matters. Hamilton ended up at the back of the pack, after which he drove an incredible race and managed to make his way back up the order to finish in second place. Raikkonen finished third. The victory was Vettel's 51st F1 victory, and it enabled him to equal Alain Prost's record of 51 Formula 1 victories. It also ensured that Vettel increased his lead in the Championship Standings by eight points. The German driven now has 171 points to Hamilton's 163 points. Despite the troubled start to the race, Hamilton managed to move from last to sixth on track by the end of the tenth lap. Meanwhile, Raikkonen was given a 10 second penalty for the collision with the British driver. Ferrari opted to make Raikkonen serve this penalty out early on in the race, bringing him into the pits after 13 laps and sending him back out on track on medium compound tyres. Vettel, meanwhile, had managed to run away at the head of the order, with his only real threat coming from Valtteri Bottas in the second Mercedes. After both Vettel and Bottas pitted, it seemed like fight for victory was to be fought between these two. Vettel appeared to be struggling on the mediums and Bottas was fast catching him. Then came the first Safety Car situation, after Marcus Ericsson of Sauber suffered a massive crash. Vettel and Raikkonen were brought into the pits at once, which ensured they were back on track on fresh tyres. Mercedes opted to keep their drivers out on track, thus promoting Bottas to race leader. Hamilton was third on track when the race was restarted, with Vettel second. The track wasn't green for very long though, and a clash between Remain Grosjean in the Haas and Carlos Sainz Jr in the Renault F1 car brought the SC out again. When racing resumed, it was Bottas in the lead, defending hard from Vettel. However with just five laps left in the race, Vettel muscled his way past the Mercedes and took the lead of the race. Bottas, new struggling on the medium tyres would drop further down the order, with both Hamilton and Raikkonen managing to get past him. Despite the fact that Hamilton tried to get closer to Vettel, and hopefully take the race lead, that was not to be. The podium at the 2018 British Grand Prix. 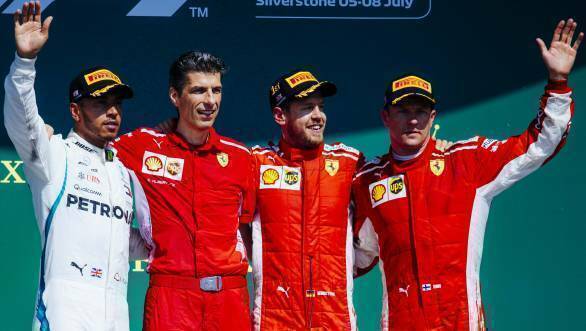 Mercedes driver Lewis Hamilton looks less than happy to have finished second at his home race, Vettel is well pleased with the win, and Kimi Raikkonen, well, looks as only Kimi Raikkonen would as he stands on top of the podium! 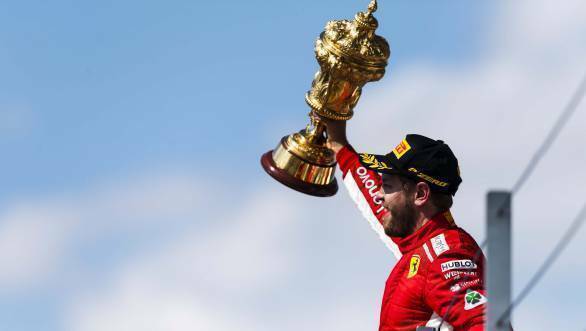 So it was that Sebastian Vettel took his 51st Grand Prix victory, with home hero Lewis Hamilton second at Silverstone, and Kimi Raikkonen third. Valtteri Bottas finished fourth, with Red Bull Racing's Daniel Riccardo fifth. Nico Hulkenberg finished sixth for Renault, with Force India's Esteban Ocon taking seventh. Fernando Alonso finished the race eighth for McLaren, with Haas' Kevin Magnusson finishing ninth and Sergio Perez ending the race tenth in the second Force India. It was another disappointing outing for Toro Rosso's Brendon Hartley who suffered a massive crash earlier in the weekend, started from the pitlane, and then retired on the first lap. 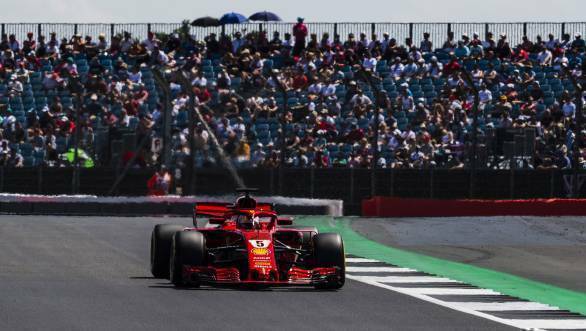 The head of the Constructor's championship sees Ferrari leading with 287 points, Mercedes is 20 points adrift with 267 and Red Bull Racing down in third with 199 points.